I am looking for a pattern for an alb that is different from the one you have for sale--the type that is gathered at the neck, has a band collar and ties in front. Also, the sleeves are much narrower than the alb you sell. Do you have such a pattern or know where I can purchase one. 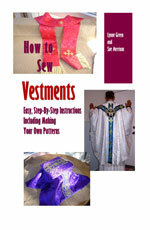 Cherie Cooper can order the requested alb pattern from Sew Vestment.com. I'm sorry Cherrie, but we only have one alb pattern.